Courtesy of Denise L. Paulson, Alain Pinel, REALTORSÂ®. Luxury views to the North of Salesforce Tower, Financial Dist., and Bay. Floor to ceiling windows floods the rooms with natural light. 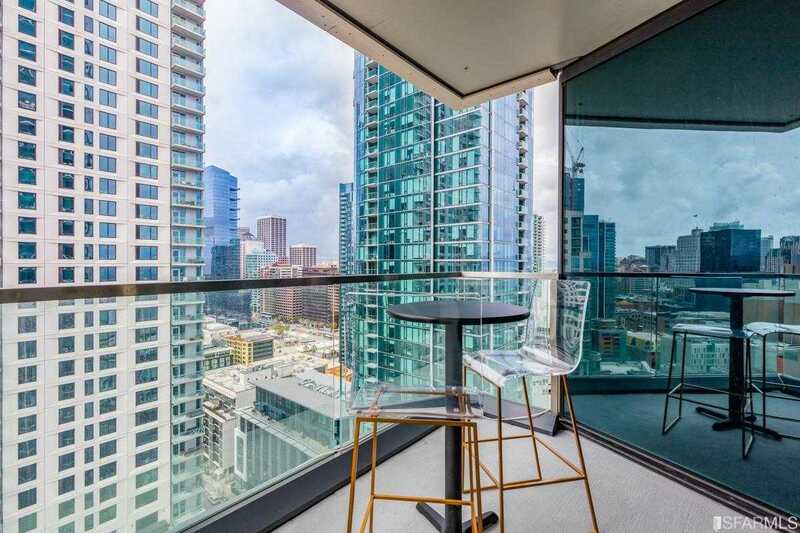 Upgrades include: wide plank Siberian Oak flooring, timeless patinated brass fixtures by Waterworks, Carrara marble accents, Bertazzoni range, and sub-zero refrigerator, accent wall paper in all rooms in this 2 bed/2 bath residence. Easy access to Bay Bridge or Silicon Valley. Uncle Harry’s sky lounge with unparalleled views, gym with men and women locker room (steam room), 24 hour lobby attendant, concierge service, valet parking, lap pool, morning coffee and pastries, and on site management.